Where to find Wichita Falls hotels near an airport? Where can I find hotels in Wichita Falls that are near tourist attractions? Going to Wichita Falls? There's a wide range of accommodations to choose from. You can search 25 hotel options within 0.1 kilometres (0.06 miles) of downtown Wichita Falls on our up-to-date accommodation database. You'll find Candlewood Suites Wichita Falls at Maurine Street and Comfort Inn within walking distance from Wichita Falls' city center. Budget travelers rejoice! Wichita Falls offers a solid range keenly priced establishments. 7 kilometres (4 miles) from Wichita Falls' center you'll find the Wichita Star Hotel. The Howard Johnson Wichita Falls is just 5 kilometres (3 miles) away. Additional lower-cost accommodation options include the La Quinta Inn Wichita Falls Event Center North and the Quality Inn And Suites Wichita. 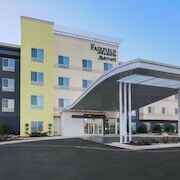 You could investigate the Homewood Suites by Hilton Wichita Falls and also the Courtyard by Marriott Wichita Falls. 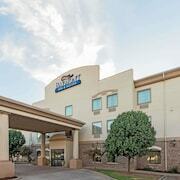 The Homewood Suites by Hilton Wichita Falls is located 6 kilometres (4 miles) away from the middle of Wichita Falls. 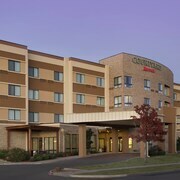 The Courtyard by Marriott Wichita Falls, is positioned 6 kilometres (4 miles) away. Some other options are the Holiday Inn Express Wichita Falls and the Hampton Inn Wichita Falls Sikes Senter Mall. The wider Panhandle Plains area is certainly worth discovering as well. Panhandle Plains boasts prairies. Commonly visited Panhandle Plains visitor attractions are farms. In this section of United States of America travelers may enjoy mountain biking and hiking. The nearest accommodation options in Panhandle Plains are Vernon and Graham. Vernon is 80 kilometres (51 miles) to the west of Wichita Falls, while Graham is 95 kilometres (58 miles) to the south. 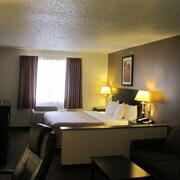 Accommodations in Vernon are the Holiday Inn Express Hotel & Suites Vernon College Area and Hampton Inn Vernon. 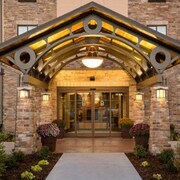 The The Inn at Revel Manor and Holiday Inn Express Hotel & Suites Graham are amongst the accommodation options in Graham. Consider spending an afternoon cheering along with Panhandle Plains sports fans at a local sporting fixture. You'll find Kay Yeager Coliseum 0.5 kilometres (0.3 miles) to the northwest of Wichita Falls. For visitors who are interested in sleeping nearby, make a reservation in the Red Roof Inn Wichita Falls or Super 8 Wichita Falls TX. Situated 7 kilometres (4 miles) from Wichita Falls is Sheppard Air Force Base Airport. 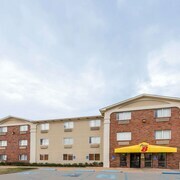 Stay nearby at Americas Best Value Inn or Motel 6 Wichita Falls North. What are the most popular Wichita Falls hotels? Are there hotels in other cities near Wichita Falls? What other types of accommodations are available in Wichita Falls? Explore Wichita Falls with Expedia.ca’s Travel Guides to find the best flights, cars, holiday packages and more!